Gala Ball Tickets on Sale NOW! 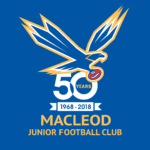 Macleod Junior FC is thrilled to announce a special event commemorating and celebrating the 50th anniversary of MJFC. This will be the pinnacle event in the 50th Anniversary year. This once-in-a-lifetime event will focus on all eras of the club’s history, and the players who took to the field throughout them, and who progressed to the highest level at VFL/AFL level. Many former players, members, families, sponsors, administrators and volunteers who have been associated with the club throughout its enviable history will be in attendance to reminisce about their experiences with the famous Eagles. Tickets are strictly limited, so we recommended you book your place to avoid disappointment on missing out. You can buy a single ticket, get a group together or buy an entire table of ten. You just need to indicate who you wish to be together on a table. Cost: $95 per ticket. (Includes: 3 course meal and beverages, entertainment and announcement of the Hall of Fame). Simply use the booking form below to order your tickets. ← Girls football has arrived at Macleod JFC!